Do you want a delicious, frothy coffee with a choice of espresso? 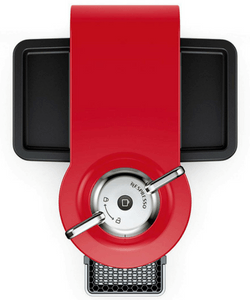 Look no further than this Nespresso Evoluo Machine! It’s a two-in-one Coffee and Espresso Machine and has many cool features. Brewing coffee and espresso drinks can be a handful if you need two machines to make them. The Nespresso Vertuo Evoluo Coffee and Espresso Machine by DeLonghi is an excellent choice for coffee lovers who love sipping coffee or espresso each morning. You can brew either one at a push of a button with this convenient and easy to use coffee machine. 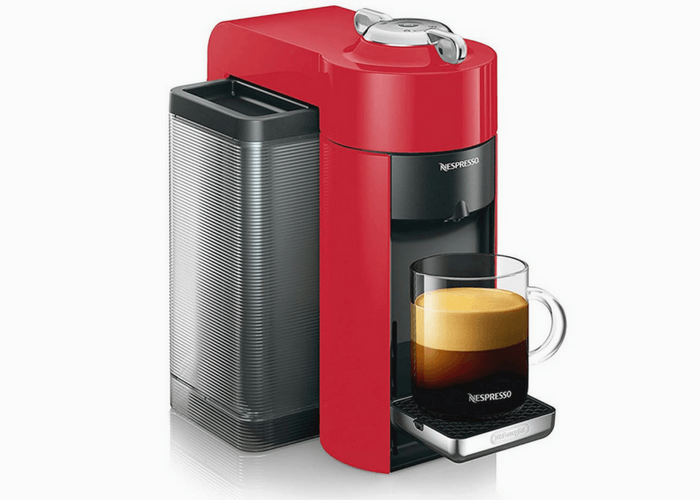 First, we’ll go over the features and benefits of the Nespresso Vertuo Evoluo Coffee and Espresso Machine. Next, we’ll dive into the drawbacks that the Nespresso Evoluo may have for some customers. Then, we’ll explore more about the De’Longhi company. Finally, we'll provide realistic viewpoints by talking about some Independent and customer reviews. Ready for some exciting coffee information? Let’s dive in! Easy single-serve operation with crema in the coffee. Different coffee cup sizes for each individual's unique tastes (espresso: 1.35 oz, double espresso: 2.7 oz, grand lungo 5 oz, coffee: 7.7 oz, alto: 14 oz). Bar-code reading with recyclable capsules. Free gift with purchase: 12 free Nespresso Vertuo capsules. Extra large 54 ounce water tank for easy filling. Convenient capsule container which holds 17 used capsules. Pretty fast preheating time of 15 to 20 seconds. Automatic energy-saving function which turns off after 9 minutes of inactivity. Compact dimensions of 9" x 12.2" x 12.3". Weighs in at 10.96 pounds. Unique Barcode Reading: Enclosed in each capsule is a specially made capsule called Nespresso Vertuo capsules. These have a unique and stylish design with vivid colors. They have a barcode embedded on the underside of the capsule rims. The bar-code enables the coffee machine to read whether to make coffee or espresso. The blend of coffee or espresso inside the capsules, also known as Grand Cru, is brewed with one button. It’s a very nifty feature because the coffee machine adjusts itself when it reads the barcode. Nespresso Club: The Nespresso Club is available for those who want or need advice or questions answered. They also offer recycling services for club members. 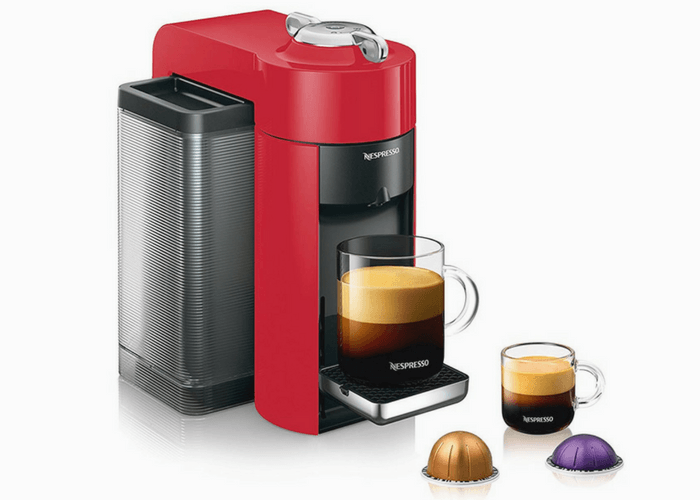 Free Capsules: When you buy a Nespresso Vertuo, then you receive a free box of 12 Nespresso Vertuoline capsules. All the capsules in this free collection are all different blends of Grand Cru coffee. Nespresso makes their own gourmet blend of coffee to make sure it’s flavorful and unique with each cup. Grand Cru Options: The Nespresso VertuoLine capsules encase specially made coffee blends that are completely airtight. They have 10 various kinds of coffee and 4 different types of espresso blends available. Each one entails different potent roasts and flavors. No need to add creamer to the coffee either, because there’s crema in the coffee capsules. There’s plenty to choose from, so experiment to find your perfect coffee for your taste! 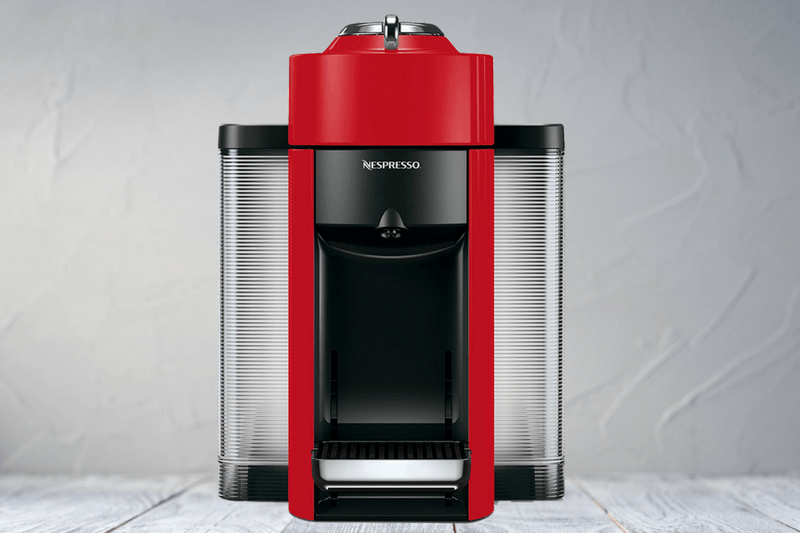 Centrifusion Technology: Nespresso Evoluo coffee machines have a special perk that brews excellent coffee in every cup. It’s made possible by this patented extraction technology called Centrifusion. After enclosing a capsule in the coffee machine, twist the knob until it clicks. The capsule prepares delicious coffee by spinning 7,000 rotations per minute. This brews the ideal combinations of coffee with crema or espresso! Loud Brewing Sounds: Some Amazon reviewers point out that this machine makes some loud noises as it brews. As the YouTube video shows, it does tend to create some loud noises as it brews a delicious cup of coffee. Like other espresso machines, this might be a little loud for some who like quiet mornings. Although this could be a fantastic machine for those who need a little more help waking up each morning. Coffee Temperature: Many Amazon reviewers say that this machine doesn’t provide hot enough coffee for their taste buds. Everyone’s tastes vary from one another. Some reviewers rave about the temperature being perfect for them. Some reviewers don’t like the temperature of the coffee. They say it’s not warm enough. One Amazon reviewer said they run an empty capsule before making a cup of coffee. This makes the coffee hotter since the machine gains enough time to heat up properly. Sizes of Coffee Capsules: There are different sized capsules from 1.35 oz to 14 oz. These are not based on any settings or buttons pressed on the machine like most coffee machines have. To get a 14 oz. cup of coffee, you’d have to buy the 14 oz. capsules. These 14-ounce capsules come with a downside of being more costly than the other capsules. They also have what other reviewers say tastes “watered down”. Nespresso VertuoLine Capsules Only: This machine only takes Nespresso VertuoLine Capsules. These capsules use the barcodes that the machine reads to make coffee or espresso. Also, these capsules can also be more expensive than other coffee pods or brands. Yet, most reviewers savor the taste of Grand Cru coffee blends. 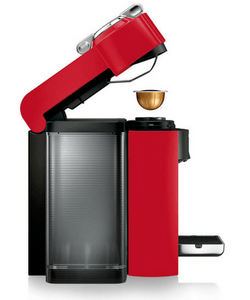 De’Longhi specializes in coffee, kitchen, and home goods products. They’re an Italian company that’s been around since 1974. Therefore, De’Longhi is making their name known in the coffee world by creating great coffee machines. They are known for their ‘easy to use” products like this espresso coffee machine. Going over the features and benefits of the Nespresso Vertuo Evoluo Coffee and Espresso Machine is an effective way to learn more about it. Now, let’s see what actual customers think about this product. We will explore some Independent review sites and customer reviews from Amazon. This can be beneficial for those browsing for their perfect coffee machine. This product comes highly rated on Amazon. It has a four-star rating with over 114 customer reviews. One verified purchaser mentions this coffee machine makes ‘delicious frothy coffee”. They raved about the good coffee options available in the selection of capsules. They also speak favorably about the cup tray because it’s easy to adjust the height for a small or large cup. Another Amazon verified customer called this coffee machine ‘flawless, perfect cup every time”. They enjoyed the taste of the coffee over the ‘over-roasted Starbucks”. This user stated that they liked this coffee more than Starbucks coffee. They also noted this coffee ‘tastes SO much better”. Another reviewer seemed satisfied with their purchase. They described how they invested more money in coffee machines in the past. This coffee machine ‘has more bars of Pressure” and it's easier to clean than other coffee machines. They were also satisfied with the results of the espresso, ‘makes a better espresso”. If you’re browsing for a coffee and espresso machine, then the Nespresso Vertuo Evoluo Coffee and Espresso Machine represents a superb choice. It’s effortless to use and clean, but it also prepares unique coffee and espresso blends. This coffee machine makes mouth-watering coffee with crema or espresso with every cup! If you are searching for an easy to use coffee machine without the trouble of cleaning up in the mornings, then this is the coffee machine for you!